Social Security Claiming: Retirement, Spousal and Survivor Benefits. Both An Economic and a Personal Decision. Knowing when and how to claim your Social Security benefits is not easy. However, a November 2015 law made certain claiming strategies easier to understand, but not as lucrative for married couples. Let’s take a look at strategies to collect monthly Social Security amounts when both you and your spouse are living. We will review survivor benefits and how individuals who have been married more than one time claim their benefits. When and how to claim your Social Security is both an economic and a personal decision. In late 2015, a law was passed to eliminate prospectively two claiming strategies for married couples. This law was passed in an effort to reduce Social Security costs. These strategies are called “file and suspend” and “restricted application”. Both of these strategies enabled the receipt of spousal benefits while one or both spouses were awarded delayed retirement credits. These delayed retirement credits have the effect of increasing social security benefits. 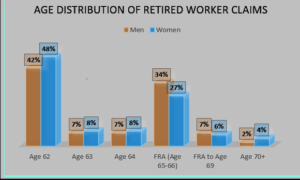 This increase is 8% per year between full retirement age (FRA) and age 70. Those who were eligible for “file and suspend” had 180 days from the bill being signed (approximately April 30, 2016) to take advantage of this filing strategy. If you had not turned age 62 by December 31, 2015, you were not eligible for “restricted application”. This applies to both married couples and those who have divorced. These claiming strategies have been eliminated for most future retirees. Therefore, this article will focus on claiming strategies available to those future retirees. 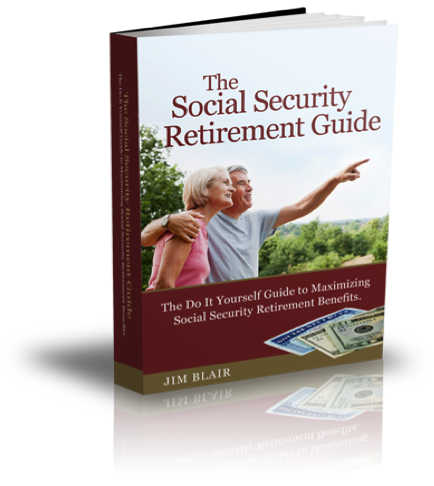 Everyone wants to maximize their Social Security benefits. To maximize your annual benefit, the longer you wait to begin collecting, the better. Therefore, waiting until you reach age 70 will give you the maximum annual benefit. However, that does not mean you will collect the most money from Social Security in your lifetime. How long you live will also have an impact on your lifetime Social Security benefits. 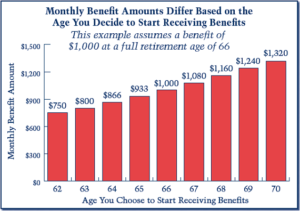 This chart illustrates how your monthly benefit amount increases the longer you wait to begin receiving your benefits. You can begin receiving a reduced monthly benefit as early as age 62 (60 for survivors), your normal benefit at your full retirement age, and an enhanced benefit as late as age 70. There are two primary drivers in calculating your Social Security benefits. They are your average indexed monthly earnings (AIME) and the primary insurance amount (PIA). The AIME is calculated by adding the highest 35 years of indexed earnings and dividing the result by the number of months in the 35 year period. Indexed earnings are earnings adjusted for changes in the general wage level which occurred during your working career. The PIA is calculated using your AIME and a formula to arrive at a monthly Social Security benefit at your full retirement age. However, the formula is based on the year when you first become eligible for Social Security. The formula includes “bend points” (2017: $885, $5,336) which are adjusted annually multiplied by percentages which have never changed (90% , 32%, 15%). Here is how the “bend points” work. According to the Social Security Administration, the AIME for an individual who earned the maximum taxable earnings subject to Social Security tax for the last 35 years ending in 2017 is $9,784. This means you would have paid into Social Security the maximum amount each year. Assume 2017 is the year you turned 62 and you’re FRA is 66. Therefore, the formula requires you use the bend points from when you turned 62. Using the 2017 “bend points” and the percentages above, that person’s monthly social security benefit at age 66 will be approximately $2,887 ($885 x 90%= $796 plus, $4,451 x 32%=$1,424 plus, $4,448 x 15%=$667). However, at age 62 the reduced benefit is approximately $2,153. If you continue to work between ages 62 and 66 years your AIME may be adjusted upward. This might occur because your 35 years of indexed earnings may increase. Therefore, your full retirement benefit may be adjusted upward as well. The formula used to calculate your monthly benefit is to replace, on average, approximately 40% of an individual’s pre-retirement earnings. However, for individuals earning more than the Social Security taxable wage base it can replace far less than that amount. For individuals earning less than average, it will replace more than the 40%. There are two things you have the ability to control as it relates to the AIME. Your level of earnings over 35 years is the most critical factor in determining the AIME and ultimately the PIA. In addition, if you do not have 35 years of earnings, a zero is used in the calculation. You may increase your benefit if you work longer and replace a zero in the calculation. Similarly, if you have 35 years of earnings, working longer may give you larger numbers to replace previous years’ earnings in the calculation. Your FRA can be from 65-67 years of age depending on your year of birth. You get a reduced benefit if you retire before your FRA. If you retire at 62, your benefit will be reduced by approximately 20-30% depending on your year of birth. You can enhance your benefit by 8% per year after your FRA. No additional benefits accrue after age 70. The chart below, using data from 2013, illustrates at what age retirees began collecting their Social Security benefits. Social Security was not taxable until 1984 when Congress passed amendments to Social Security Laws. The amendments required 50% of Social Security payments to be added to taxable income in certain circumstances. In 1993, legislation was passed to increase the 50% to 85% for certain higher income beneficiaries. 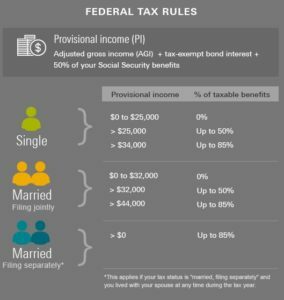 The infographic below shows if your provisional income exceeds certain thresholds, your Social Security is taxable for federal purposes. Most states do not tax Social Security benefits; however, there are at least a dozen states that do. Check your individual state as you do your tax planning. If you collect Social Security benefits prior to FRA and continue to work you could lose benefits. You forfeit $1 in benefits for every $2 earned over $16, 920 in 2017. Earnings include the wages you make from your job or your net profit from self-employment. Earnings do not include items such as: pensions, annuities, investment income and interest. The rules for spousal and survivor benefits are quite complex and must be reviewed on a case by case basis. However, I have included some discussion below. Included in the Bipartisan Budget Act of 2015 is the term deemed filing. Deemed filing means that when you file for either your retirement or your spousal benefit, you filed, if eligible, for the other benefit as well. You must then receive the greater of the two benefits. Under the old law deemed filing only applied if you filed for benefits before full retirement age. The new law extends deemed filing to full retirement age and beyond. The Act requires your spouse to be receiving benefits before you can collect a spousal benefit. Therefore, if you begin collecting your benefit on your own work record, you should switch to your spousal benefit, if it is larger, when your spouse begins collecting benefits. Spouses can claim a Social Security benefit based on their own earnings record, or collect a spousal benefit. Normally a spousal benefit is 50% of the spouse’s FRA benefit amount. This amount is reduced if the spouse claiming the benefit files early. If one spouse is already receiving his/her own benefit, and later becomes eligible for a spousal benefit, there is a formula that is used to determine the amount of spousal benefit they may receive. There are two parts to the benefit calculation. The retirement benefit based upon the spouse’s own earnings record and the spousal benefit add on. Spousal benefits are calculated by subtracting your monthly benefit at FRA from 1/2 of your spouse’s benefit at FRA. If you claim your retirement benefit early, the benefit based upon your earnings record will be permanently reduced. If you then claim a spousal benefit at FRA (66), the spousal benefit will not be reduced and it will be added to your reduced retirement benefit. For example, let’s say your monthly benefit at FRA is $800 and your spouses FRA benefit is $2400. Your spousal benefit would be $400(2400/2=1200-800=400). If you claimed your retirement benefit early at 62, it was reduced from $800 to $600. When you claim the spousal benefit at FRA, you will receive the extra $400 for a total of $1,000. Your retirement benefit and spousal benefit are calculated separately. 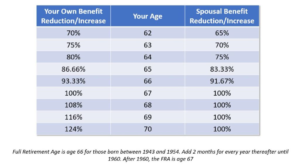 The chart below shows if you file for either your retirement benefit or your spousal benefit at other than your FRA, there will be an increase or reduction in your benefit. Your retirement benefit will increase until age 70, if you do not claim that benefit at FRA. However, your spousal benefit will not. You may be able to collect benefits on your former spouse’s earnings record. This can happen if you were married at least 10 years and have been divorced for at least 2 years. You must not be remarried. Your former spouse must be at least 62 and eligible for their own Social Security benefit. In addition, the benefit you are entitled to receive based on your own earnings record must be less than the benefit you would receive based on your ex-spouse’s earnings record. If you remarry, you generally cannot collect benefits on your former spouse’s record unless that marriage ends. Unlike married couples, your former spouse is not required to be collecting Social Security for you to be eligible for a spousal benefit. Survivor benefits are one of the exceptions to the deemed filing requirements. If you are a surviving spouse and entitled to Social Security on your own earnings record, you can collect your retirement or survivor benefit first and switch to the other benefit later if it would result in a larger amount. Reduced survivor benefits are available as early as age 60. If your ex-spouse is deceased and you remarry before 60 you cannot claim a survivor benefit on your ex-spouse’s work record. When should you and your spouse claim your Social Security? It is both an economic and personal decision. If you need the money from Social Security to live – it is a “no brainer”. Collect as soon as you can. If you want to maximize your monthly benefit, wait until age 70, no later. If you want to attempt to maximize your lifetime Social Security benefit, calculate the cash flows from all alternative methods of filing. Married couples should look at the timing of each of your benefits together and not in a vacuum. Calculate the expected cash flows based upon you and your spouse’s age of filing for the benefits and your estimated date of death. The expected cash flows should be determined both on an annual basis and over your estimated lifetime. Here are some examples. One spouse takes their benefit early and switches to a spousal benefit later when the other spouse begins collecting, let’s say at FRA. Both spouses wait until FRA. One spouse waits until FRA and one waits until age 70. If you want to maximize your spouse’s survivor benefit, wait until age 70, no later. This can be looked at like a life insurance benefit. If you have health concerns and question your longevity, you may consider collecting your benefits early. However, perform a break-even analysis and determine your break-even age. That is the age where the cumulative value of all Social Security payments you receive will be the same no matter what age you decide to begin taking your Social Security. If you plan to work into your 60’s or 70’s, you should consider the Social Security benefits you will lose, because of the Social Security earnings test, if you collect before your FRA. You may want the extra cash now when you believe you are healthy enough to enjoy certain activities. Delay collecting Social Security if you are concerned about outliving your money. Everyone has different reasons as to when to collect Social Security benefits. There is no right answer for everyone and the rules are complex. Whenever you begin collecting is up to you, just remember it is a decision that could impact you and your spouse for the rest of your life. Therefore, you may want to discuss your economic and personal reasons with a trusted adviser. If you are figuring out your own Social Security situation and have a question, post it below. Covered by Medicare, Should You Have Additional Health Insurance?